How much do you know about environmental and occupational risks for cancer? This World Cancer Day, UICC joins its partner Boehringer Ingelheim to talk about the causal link between asbestos and mesothelioma and the challenges of securing a diagnosis and optimal treatment for rare cancers. UICC takes this opportunity to update its call to action on asbestos and highlights the WHO top 10 chemicals of public health concern. Asbestos is one of the top 10 chemicals or groups of chemicals of major public health concern highlighted by the World Health Organization (WHO). It causes mesothelioma and cancer of the lung, larynx and ovary. Between 1994 and 2008, a total of 92,253 mesothelioma deaths were reported across 83 countries. The latest Institute of Health Metrics and Evaluation report on the Global Burden of Disease stated that asbestos-related deaths account for about one-third of all of deaths attributed to occupational carcinogens and now stands at over 222,000 persons annually. We have known of a link between asbestos and lung disease since ancient times. The specific link with mesothelioma and lung cancer, both with a poor prognosis, has been recognised since the 1930's. Unfortunately, the number of cases of mesothelioma in industrialised countries continues to grow and is expected to peak within the next 20 years. This is attributable to the heavy use of asbestos from the 1950s through to the 1970s. Occupational exposures to asbestos occur in mining and milling of asbestiform minerals, as well as in minerals embodied in rocks that contain asbestiform fibres. Occupational exposures have also occurred and, in some cases, continue to occur in non-mining settings. These include the construction, thermal and electrical insulation, roofing, friction materials, cement, textile and ship-building industries. WHO estimates that about 125 million workers in the world continue to be directly exposed to asbestos. 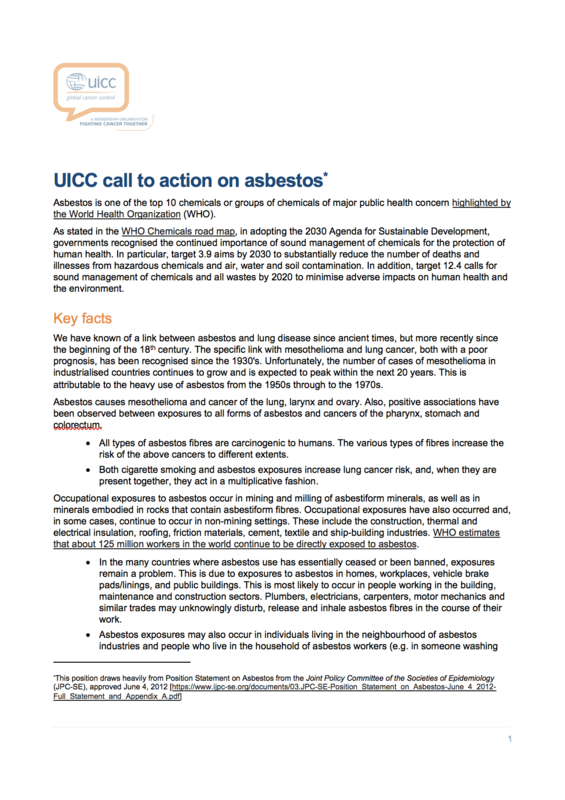 UICC has listed 7 major recommendations, including a global ban on mining and export of asbestos, information to citizens and healthcare workers on asbestos toxicity, and urges governments to provide best possible care, early diagnosis, treatment, social and medical rehabilitation or palliative care to individuals exposed to asbestos. UICC will join Boehringer Ingelheim's special World Cancer Day Facebook Live event today to discuss rare mesothelioma and its unmet treatment needs. Join the live panel of experts, including UICC's Director of Advocacy Dr Julie Torode and oncologist Dr Thomas Wehler, as they dive into a discussion on WHO’s response to asbestos, public health obligations to create workplaces that reduce cancer risk, and the policies needed to address rare cancers.